Here's an in-depth guide to using HPE LoadRunner Controller, with an intro, goal-oriented scenario, and manual scenario. In this article, you are going to learn about HPE LoadRunner Controller. HPE LoadRunner software package mainly consists of three installable: VuGen, Controller, and Analysis. VuGen is to record and create scripts; Controller is to create scenarios, and Analysis is for analyzing the test results. Controller is one of the critical components in LoadRunner workflow which helps to create scenarios. The scenario is a collection of one or more scripts. A scenario defines the test duration, how the virtual user should simulate, how actions should be performed, and which machines should generate load/inject. 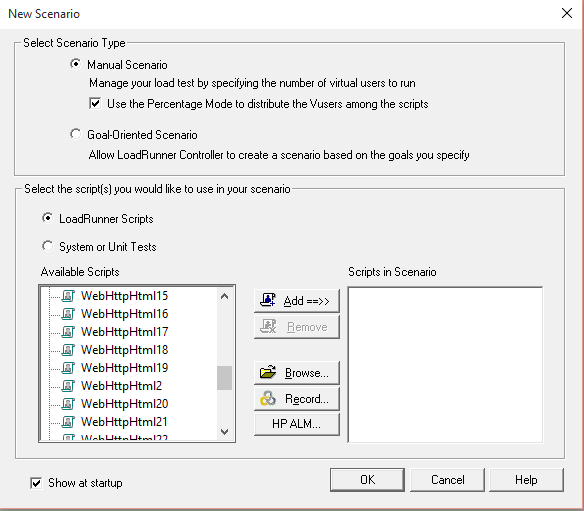 You define following fields while creating the scenario in the HPE LoadRunner controller. When you invoke Controller, you will get above screenshot where you need to select the scenario type and the scripts to be load tested. There are two types of scenario: Goal-oriented and Manual scenario. Goal-oriented scenario helps to define our goals to achieve where LoadRunner automatically builds a scenario. E.g. if you want to inject 50 hits per second, just mention the goal as shown in the below screenshot. Controller can run Vuser scripts as well as system/unit tests such as Selenium tests, NUnit, and JUnit tests. Manual scenario helps to build a scenario by mentioning VUsers, load generators and the load pattern. You can design a manual scenario by using following mode: Vuser group and percentage mode. Vuser group mode helps you define the scenario by entering the number of Vusers for the script to each group. Percentage mode allows you to distribute the VUsers as per the percentage allocated for each script.